6.35 points at 20 votes (rank 554). 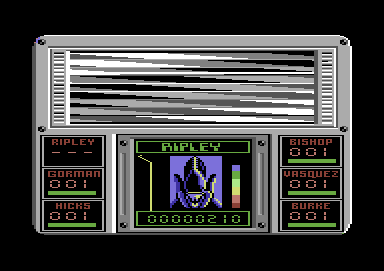 Aliens - The Computer Game by Electric Dreams Software is the game to the movie. The game was published in Europe and the USA on 31th December 1986. 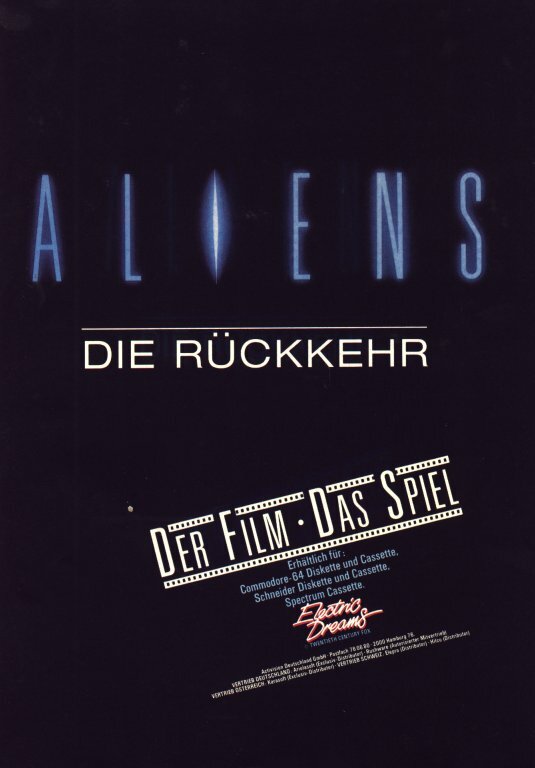 The second game with the same title by Activision was sold later with the addtion US version by Electric Dreams in Europe. The game is a shooter in which you need to fight your way through a building complex. During this you are chased by mean aliens who are out to get you. You have 6 people that you need to rescue. They correspond to the characters in the movie. The aim is to enter the queen's room, clean it and then get back to the entrance with all persons that are left. The whole thing gets especially exciting as only limited ammunition is available and the pulse rises after every attack. The game is designed very minimalistically. The game area is a relatively small area in the upper half of the screen. This is explained by being the helmet camera. Within rooms you can only scroll to the left or right. They are either red or blue and with some exception all look the same. The graphicians have designed the rooms very nicely. The same can be said about the characters which create a real alien feeling. The grey aliens themselves look great. 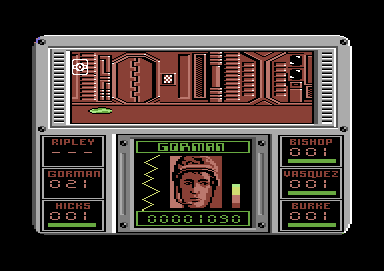 In contrast to the other versions of the game has the C64 version no music. The only sound next to the shooting noises is the crescendo siren wail which indicates that an alien is in the same room. The longer you do not do anything about the alien, the sharper will the sound get. The rooms are all numbered and for every character you see in which room it currently is. A room with an alien. With the key M the game is restarted. Doors are used with the key Space . With the number keys and one of the direction keys (N ,S , W , E ) you can instruct a character to move the corresponding number of rooms to the north, south, west or east. So e.g. if a character is supposed to go 3 rooms to the east you press 3 followed by E for east. This way characters can move over overgrown doors and they stop automatically if a further proceeding is not possible due to the map. The game is controlled by joystick. The white crossline can be moved around freely in the room. However, the character gets tired with every movement. The state is shown by the green bar below the room number. If the exhaustion reaches a low value also the cursor will slow down. This can get especially dangerous if you cannot react fast enough to an alien that has just entered the room and you have just made a small break. To keep aliens from entering a room while making a break you can lock the doors. You can reach this by shooting at the keys next to the door. To be able to use the door yourself again you need to shoot at the door. As the doors can only be locked once you should therefore think long and hard about whether you really want to close the door! The Alien Queen and a group of fighting drones can break through the door although it was locked. This member is ...erh... dead. 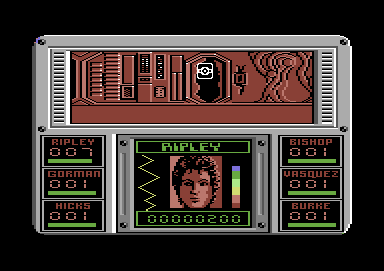 In this game the aliens appear in four shapes. The grown-up drones, the fighting drones, the small Facehuggers and finally the Alien Queen. While the drones scuffle slowly through the rooms until they have caught then scent, facehuggers scurry briskly over the ground. 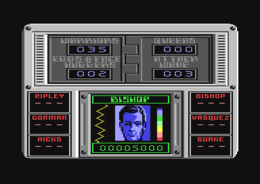 At the beginning of the game you get therefore quickly used to eliminating the drones instantly by an aimed shot in the head. If you have a team member near, you can survive for a short time. The drones start to ensnare the character into the wall structure. 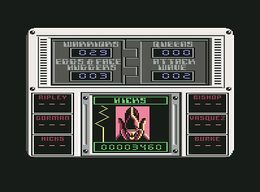 If you can enter with a second character at the right time and eliminate the guarding alien, the first character will survive. As soon as the face of the character was exchanged with an alien face the character is definitely dead. 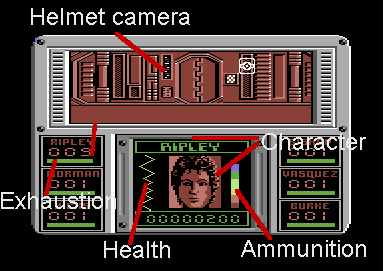 The facehuggers confuse the player in the first seconds as the small mean creatures slide over the ground and you have to adjust yourself to not shooting at the head but at the ground. The drones can be eliminated by an aimed shot at the head or by three hits on the body. The Facehuggers explode with every hit. If you hit an alien directly in front of the door, this results in an acid stain. If you now try to use this door, you automatically die. After some time the acid disappears again. The further you proceeed into the base, the more active the aliens get. The time until an alien enters the room in which you are, gets shorter step by step. Also, the number of aliens that enter the room rises step by step. Especially in combination with the exhaustions and the low amount of ammunition the game quickly turns from a calm game into a hectic butchery. The aliens will start to cover the walls with alien structures after a short time. If the structures grow, this has different effects. One is, that now Facehuggers will creep through the rooms, another is that the structures themselves can cause severe problems. The structures cover doors through which you might have to go. If the control room or reactor room are covered with structures, the light will fail, which heavily aggravates the survival of the characters. In the course of the game you might meet Newt. Newt is a small girl that could hide from the aliens. When you find her, she is either motionless or she will hide in the shafts of the premises. Each encounter with Newt gets the player 1.000 points. The aim of the game is to reach the nest of the queen in room 248 and shoot all the structures from the walls. Then you need to get all the marines left back to room 1 to successfully end the game. Robotron2084: "A complete different approach was taken in the conversion of the movie material in comparison to the version by Activision. 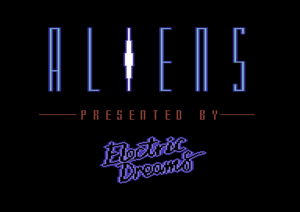 Aliens by Electric Dreams is a prime example for a hectic crisis management game in which already after several minutes the proverbial sh**t flies forcefully into the fan. Exactly like in the movie the player can experience here the panic-like rigour that will grab him when suddenly hell breaks lose at all frontlines. Unfortunately, some big slips were made in the game design, as e.g. almost the complete sound is missing except for the alarm and the shooting noises. Also choosing the key "m" for aborting the game, which lies exactly next to the constantly needed "n", is - if put mildly - suboptimal. It would also have been nice if some rooms had more functions other than having to keep them free from structures. Despite these faults and a certain monotony in the course of the game is Aliens a great game which can beat the competition product. It is atmospherically really tight and implemented properly. 8 out of 10 points." This page was last modified on 3 September 2018, at 15:19.